As of R1 2019, the RadExpression control also provides a number of functions for string manipulation. They can be found in the new Text subcategory illustrated in Figure 1. ConvertToString: Returns the string representation of an object. Substring: Retrieves a substring from a string. The substring starts at a specified character position and has a specified length. Concat: Concatenates two specified instances of System.String. Format: Replaces the format item in a specified System.String with the text equivalent of the value of a specified System.Object instance. Trim: Removes all occurrences of white space characters from the beginning and end of this instance. Len: Gets the number of characters in a string. IndexOf: Reports the index of the first occurrence of the specified string in this instance. 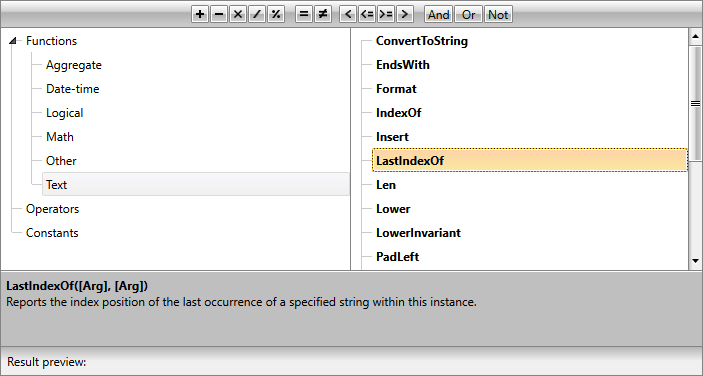 LastIndexOf: Reports the index position of the last occurrence of a specified string within this instance. Insert: Inserts String2 into String1 at the position specified. Lower: Returns the string in lowercase. Upper: Returns the string in uppercase. LowerInvariant: Returns a copy of this System.String object converted to lowercase using the casing rules of the invariant culture. UpperInvariant: Returns a copy of this System.String object converted to uppercase using the casing rules of the invariant culture. PadLeft: Right-aligns the characters in the defined string, padding its right side with white space characters up to a specified total length. PadRight: Left-aligns the characters in the defined string, padding its left side with white space characters up to a specified total length. Remove: Deletes a specified number of characters from this instance, beginning at a specified position. Replace: Returns a copy of String1, in which SubString2 has been replaced with String3. StartsWith: Determines whether the beginning of this string instance matches the specified string. EndsWith: Determines whether the end of this string instance matches the specified string. Contains: Returns a value indicating whether the* cified System.String object occurs within this string.